The Mercedes F1 W05 Hybrid n.44 is the car that dominated the Formula 1 World Championship in 2014. After more than fifty years the German manufacturer decides to return to Formula 1 not only as a motorist, but also as a chassis artist, buying the team by Ross Brawn, winner of the previous year with the Brawn BGP001. With the new regulations, the turbo engines combined with the hybrid and the German one will see the most powerful and reliable mounted on the chassis designed by the Italian engineer Aldo Costa. 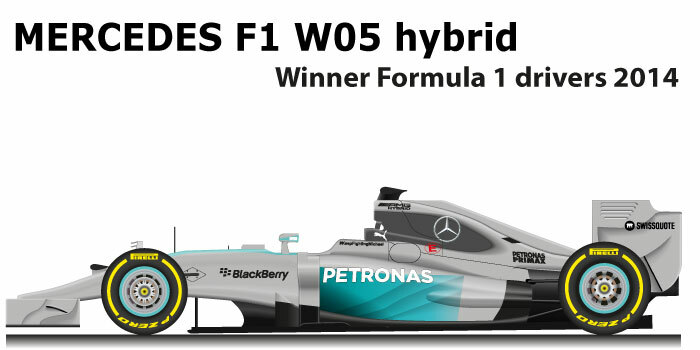 Lewis Hamilton with the Mercedes F1 W05 Hybrid n.44 wins the 2014 Formula 1 World Championship. For the British rider he is the second title after the 2009 championship. During the season he dominates eleven Grand Prix, while his teammate Nico Rosberg gets five wins. Mercedes also wins the constructors’ title with sixteen wins on nineteen Grand Prix. GP winner: GP of Malaysia 2014, GP of Bahrain 2014, GP of China 2014, GP of Spain 2014, GP of Great Britain 2014, GP of Italy 2014, GP of Singapore 2014, GP of Japan 2014, GP of Russian 2014, GP of Usa 2014, GP of Abu Dhabi 2014.